Model T Ford Forum: Getting there with my '13 Canadian touring!!! Getting there with my '13 Canadian touring!!! 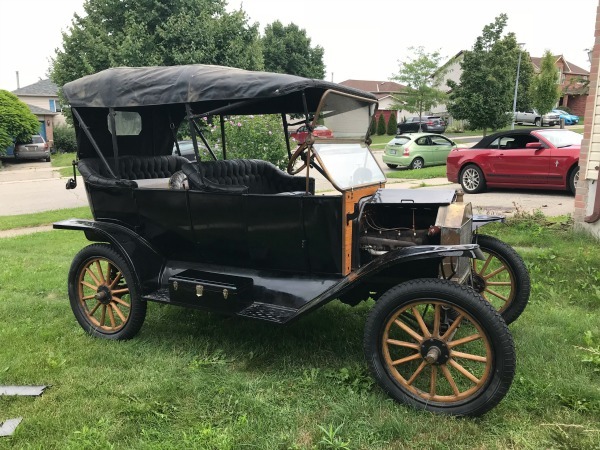 Model T Ford Forum: Forum 2018: Getting there with my '13 Canadian touring!!! Well, I've been busy with my Grandad's 1913 Canadian touring. Did a tune up consisting of a new Anderson timer, new wiring harness, set timing rod, rebuilt coil box & switch, took off timing cover & cam gear & blew out oil line, took off hog's head & installed new Kevlar transmission linings, installed a nice set of Champion X's & new wires, and installed a brass Holley G carburetor I rebuilt. I put 4 new Wards Riversides, tubes & flaps on her today. It starts on magneto on 1st or 2nd pull every time!!! Feelin' pretty darned happy about the whole thing....that, and I'm aching from head to toe from wrestling four 60+ year old petrified Canadian Goodrich tires!! LOL! !